Let’s face it: Unfortunately, our world continues to be hit by human tragedies due to war and conflict, environmental disasters, and business misconduct. Yet, the way and degree to which we respond to such tragedies and help prevent them from happening in the future varies quite substantially. Reasons for this are manifold and complex, but I would like to discuss three specific reasons why I think the Mediterranean tragedy is likely to continue while other recent disasters are more likely to be prevented from happening in the future. Lack of government responsibility. There is no doubt that one major group responsible for not just overloading boats but also causing boats to sink are gangs of traffickers who offer people high-risk journeys to Europe in exchange for money, organs or other commodities. Yet, when it comes to fighting such trafficking practices, responsibilities are less clear. On the one hand, traffickers typically operate across borders – from Somalia and Nigeria to Libya and other countries. That is why it is difficult to ‘pin down’ which country is to be held responsible for allowing/preventing such practices (see also UNODC report). A similar problem applies to child trafficking and related forced labor practices on cocoa farms in West Africa. On the other hand, even though, due to geographic proximity, the first point of contact of incoming boats from Libya are the coasts of Italy and Malta, it is unclear who is ultimately responsible for rescue missions and preventing casualties. In the words of Italian Prime Minister Renzi, responsibility to address the problem lies with the whole world, “not just Italy and Malta.” But how “world responsibility” can turn into effective collective action is far from obvious. Lack of business interest in solutions. It may sound cynical, but the reason why some disasters can be more easily prevented from happening again are business interests. One example is the Germanwings plane crash in March, killing 150 people, which has been linked to Lufthansa’s staffing policies and working conditions. The incident has had considerable financial impact on the airline, including pay-outs of $54,000 per victim, which motivates Lufthansa to prevent future accidents, beyond their moral obligation. As another example, the devastating garment factory collapse in Bangladesh on April 24 2013, killing over 1,100 people, raised awareness of responsibility of fashion brands for workers’ safety and led leading buyers to sign the ‘Accord for Fire and Building Safety in Bangladesh’ to prevent future disasters. Even in the difficult case of transnational child trafficking in West Africa, campaigns against child labor on cocoa farms have led chocolate brands and producing countries to promote more effective measures against child slavery and trafficking. 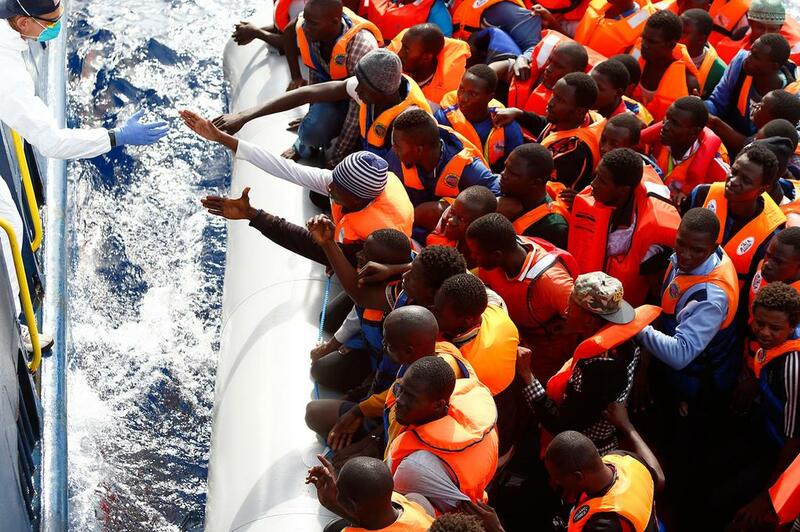 By contrast, there seems to be no immediate business interest in preventing the Mediterranean tragedy from happening – neither from the African nor the European side. This will slow down measures against this ongoing catastrophe. Lack of public support and sympathy. Another rather disturbing piece of the puzzle is the lack of coherent public support for effective measures against the killings of thousands of migrants south of European shores every year. On the surface, Europe’s “moral obligation to help” may reflect the conscience of many Europeans; yet, the “silent majority opinion” might be a more ambiguous one. In fact, the growing death toll in front of European borders coincides with a looming fear of increasing, more or less “legal” migration to Europe. Social movements against migration, such as Pegida – Patriotic Europeans Against the Islamization of the West –, are a symptom of that. And if British journalist and provocateur Katie Hopkins says in her recent, much cited and criticized, Sun article “What we need are gunships sending these boats back to their own country”, then this is perhaps more than just a single person’s opinion but a reflection of what a significant number of Europeans think. And this way of thinking may not only weaken the European mandate to conduct rescue missions and better regulate migration, but undermine longer-term development efforts to for example promote peace-building and strengthen political and economic structures in Africa and the Middle East. So what does it take to develop an effective solution, given the conditions described above? As talks among European governments are ongoing, a few organizations have already decided to take action. Among them is Medecins Sans Frontiers (Doctors Without Borders) who, in collaboration with Migrant Offshore Aid Station, will launch systematic search and rescue activities in May, no matter what European governments will decide. MSF is a transnational organization that operates independent of government, business and public support, on the basis of donations and humanitarian principles of action (donations welcome!). Do we need more non-partisan organizations like this – who operate “Without Borders” – to tackle humanitarian problems of transnational scale in the blind spot of government responsibility, business interests and public attention? Or does it perhaps take a new alliance of interests of governments, businesses and other players to complement the ongoing talks about “moral duty” with a longer-term strategy and infrastructure for coordinated action? Thoughts and comments are welcome! This entry was posted in Capitalism, Charity, Debate, Economic Development, Ethics, Inequality, Political Economy, Responsibility, Social Order and tagged Africa, Doctors Without Borders, European Union, Human Trafficking, International Organization for Migration, Italy, Katie Hopkins, Lampedusa, Malta, Mediterranean Sea, Migration, Moral duty, Refugees. Bookmark the permalink. ← Dialogue: Can Business Scholars Make a Difference in the World? Professor Manning has addressed the key of lack of government responsibility, business interest in solutions and public support and sympathy. I think these three main of the reasons are very true since government doesn’t care about its citizen especially the countries ruled by communist party. This situation are very similar to China which many thousands of people want to escape its country and try to migrate to other developed countries. I believe that many of them have died in between because it might takes more than a month to a year to do so of migrates by boat. I know it is not fair that they only wants to get a better life but that’s the reality of government only helps the middle class and they’re not willing to help the poor ones. this actually reminds me it happens a lot in my country, China. Some people in China they would prefer to take a risk to take the boat migrating to some developed countries, such as US, and it will take about in 3 months getting to the destination. They need to pay a very large amount to register for their “trip”, but the large amount of registration fee is not actually guarantee them to the destination, what they will face during on their “trip” is hunger, disease, abuse, and even death. if some people is dead during the trip, they will be just threw away to the sea. Like say if there are about 100 people on the boat at the beginning of the “trip”, there might be 10 survived at the end. But because they were illegal migration, nobody could protect them, neither the government of China nor destination countries. Search and rescue is important, of course, but hardly addresses the enduring conflicts around the middle East that are fueling these desperate migrations. The thousands who try to seek refuge across the sea are a tiny fraction of the millions suffering loss of homes, limbs, families, and life. Libya, Syria, Gaza, and Sudan amongst others are beset with economic and political collapse, various forms of civil war and military insurgencies. Western intervention in Iraq, Libya and Afghanistan is only one factor here. Bringing stability to these Arab countries is the challenge of 21st century (after climate change! but Chris, I don’t think climate is a factor in current wave of migrations). Professor Manning has clearly explained the situation and highlighted some alternatives, which is perfect in raising public awareness. However, there is a root cause not only to this particular tragedy, but also to all tragedies caused by terrorism. We should all ask who has created such business opportunity for human traffickers? The radicalism within Islam has existed for hundreds of years. Considering recent history, extremism was a limited ideology and an insignificant force. During the Cold War, Western countries empowered these butchers in Afghanistan to fight the Soviet Union. It was a very well calculated strategy and a successful tactic, but they did not foreshadow that the world will have to face these horrible forces for a very long time and the Mediterranean tragedy is a good example of this. After the collapse of the Soviet Union the West had a chance to put these forces back to suppression by supporting the secular regime of Afghanistan and other countries where extremism was active, but they failed to do so. Killing is always wrong regardless of the situation. However, when groups of people die in a plane crash, a boat sinks, or humans cause any other morally and legally wrong events, it raises public awareness. But for the past few decades millions of innocent people died in Afghanistan, the Middle East and some African countries. Regardless, such events do not raise the same fashion of awareness. Therefore, yes, it is absolutely right that there is no business interest to prevent mass killings in certain countries. I believe it is Europe’s, USA’s and other regional super powers’ moral duties to stop this geopolitical, economic, and military campaign that is the root cause for all global man-made deadly tragedies. Stephan has highlighted this tragedy as a current issue; however, I cannot help but think that this situation is only going to continue to worsen as a result of climate change. Mass migration is sadly going to be an inevitable result of famines, droughts, and increasing sea-levels. The human enterprise, and the global population, is growing faster than natural systems can cope; we are growing beyond critical planetary boundaries. Initially we will find the carrying capacity of regional ecosystems affected, but climate change is a global phenomenon that will affect everyone. Thus we cannot hope this problem will be confined to the Mediterranean, but have to recognize that climate refugees can originate anywhere we now find dense populations. Here in the US we only need to look at Hurricane Katrina and the exodus from New Orleans for a recent example, or wonder what ongoing droughts in California will mean for the population of that state in the decades to come. Addressing the issue of climate change also involves the conflict between morals and interests – but on a much wider scale. This article highlights a current crisis, but the solutions that are proposed cannot be shortsighted and need to consider the future. Any temporary or purely regional solutions are likely to become overwhelmed and fail should we start to experience truly mass migrations. If nations stop thinking about this as a humanitarian issue, and instead begin to think of this as a security concern, the types of solutions which may be chosen in the future will probably be the ones we would prefer to avoid should we find it necessary to relocate ourselves and our families. In this scenario is there no distinction between ‘us’ and ‘them’, we are all truly in the life raft together. I think this is the high time for UN and other human rights organizations to step up to solve this issue since EU is not taking any effective step. They should work together to raise/increase awareness among Africans so that they don’t want to cross the Mediterranean sea by the small boats. In addition, they should help those African countries to bring in some strong anti trafficking laws. Stephan has addressed a key question: “the blind spot of government responsibility, business interests and public attention”. The repeated boat tragedies in the Mediterranean Sea clearly point to the failure of EU policies as a major ‘blind spot’. Two crucial steps are needed: re-establish the programme Mare Nostrum, a far-reaching Italian rescue scheme abandoned in favour of the narrow EU border security programme Triton; and go for an overall concept to accept and distribute refugees, involving all 28 EU countries. As a European citizen I am only too aware of the political pressure required to achieve a breakthrough here.